How to easily make delicious beet kvass. 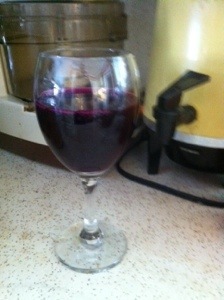 This is a picture of the beet kvass after I’ve drank most of it. Beet kvass is a wonderful and richly nourishing drink that’s loaded with probiotics and healing properties. It supports immune function and cleanses the blood. I find that it gives me energy and an overall feeling of goodness. It’s my favourite ferment right now. *update* I am finding that when I do not consume the beet kvass regularly I get dehydrated with headaches. I try to start all my mornings off with beet kvass. Here’s something else that’s interesting… If beet kvass makes your pee (not poo) red, then you have low stomach acid. I figured this out after I went on a research hunt to figure out why the beets had suddenly stopped creating red urine even though I was drinking more than ever. And when I quit drinking it for a while, the beets make my pee red again (low stomach acid) until I’ve been drinking it for about a week consistently every morning. -2-3 large beets, cut up with skins on. Notes: (do not grate your beets or they will ferment too fast and turn alcoholic). Your beet to brine ratio should be about half and half to get a good, thick kvass. To make beets sweeter for your kvass, cut tops off and leave a week to let the sugars concentrate. -1 TBSP salt (20 grams precisely)- you can use a bit less salt if you don’t like salty tastes. -some people swear adding by onions and cabbage for people that don’t like beets. 1. Put all ingredients in a jar, the clamp down ones work best. Leave a good amount of head space, about 1-2 inches. Don’t leave too much or the environment may not become anaerobic. 2. Let ferment 5-9 days on the counter, or longer. It’s fine for long periods of time as you don’t open it. 3. Strain the liquid out once its thick and delicious. Refrigerate liquid. 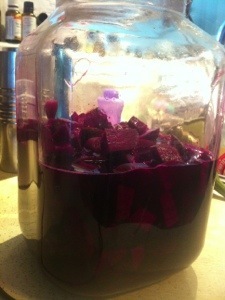 You can use your beets now to make a second batch by adding more brine. I usually add a few more beets. OR The leftover beets can eaten as pickled beets or in a salad. To make them they should be placed in another brine to ferment them further. 1 tbsp salt to 1 litre water. Add some dill?